Resiliency has been the Islanders’ rallying cry all season. They’ll need as much of that trait as they can muster after a deflating 5-4 overtime loss to the Lightning last night at Barclays Center that gives Tampa Bay a 2-1 series lead. Brian Boyle had all the time he needed to collect a shot off the end boards and snap it past the prone Thomas Greiss at 2:48 of overtime for the win — he had all that time after he appeared to catch Thomas Hickey with an elbow to the head as the Lightning entered the Islanders zone, leaving Hickey dazed and out of the play as Tampa converted the winner. 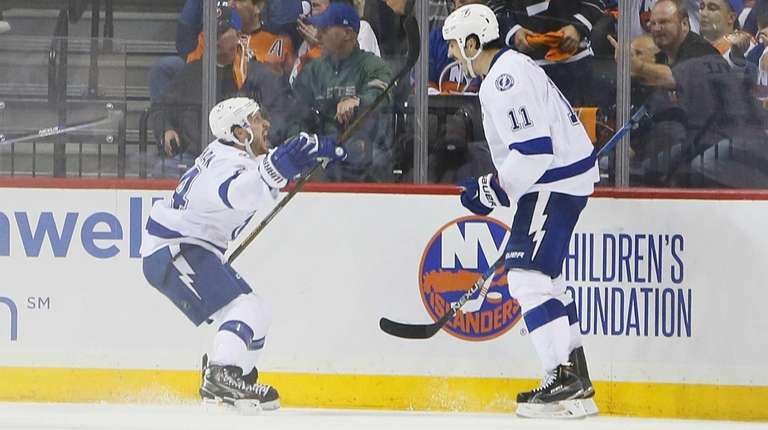 The Islanders were less than a minute away from taking the series lead in regulation when Nikita Kucherov snapped one past Greiss with 38.4 seconds to play with the Tampa net empty. The Lightning had the puck in the Isles zone for over a minute before Jonathan Drouin found Kucherov for a quick shot from the slot to send the game to OT. Cal Clutterbuck’s goal with 8:23 left in the third broke a 3-3 tie and could have been the deciding goal in a see-saw game. Jason Garrison’s pass caromed off Casey Cizikas’ skate and out to Clutterbuck, who ripped one past Ben Bishop to give the Isles their third lead of the game. But they could not pull away from a fairly resilient Lightning team. After a very strong first period for the Isles that ended 1-1 after Josh Bailey, back in the lineup after a two-game absence, scored from in tight at 7:55 and Ryan Callahan tipped one past Greiss on a Tampa power play with 12.5 seconds to go in the first, Hickey leveled Drouin as he entered the Isles zone. There was no penalty and none expected on the shoulder hit from Hickey. Drouin went to the dressing room and the Isles went to a power play after Hickey took a chop to the head. But the Lightning took the lead at 8:10 on Victor Hedman’s ripper off a faceoff win. Tampa controlled much of the play for the next few minutes until the Isles fourth line worked well below the goal line and Clutterbuck fed Nick Leddy for the tying goal at 14:50. The teams traded goals in a 58-second span early in the third, with Bailey scoring his second of the night off a pretty feed from Hickey at 2:27 and Vlad Namestnikov converting an Isles turnover into a 3-3 game at 3:25. With the lead in the closing minutes, the Isles had chances to retrieve the puck and clear the zone, but failed. Drouin, who returned midway through the third, passed through three Islanders and found his man for the tie. In overtime, the entire Islanders bench was yelling at referees Steve Kozari and Brad Watson, the latter of whom stared right at Hickey as he fell and Boyle entered the zone four on two. Now the Islanders have to come from behind in a series for the first time this postseason and show some of that resiliency before it’s too late. 1 -- Brian Boyle -- the controversial OT winner. 2 -- Josh Bailey -- two goals in a strong return to the lineup. 3 -- Nikita Kucherov -- another huge goal late in regulation for Tampa’s top scorer.